French pastries are world renowned and can become an art. Le Gargantua invites you to join for a patisserie and baking course in France, to learn about the basic techniques that will enable you to create at home beautiful classic French pastries, such as croissants, bread, puff pastry, chou pastry, creme patissiere, and mousses, for the delight of your loved ones. During your food outings, you will make little detours to explore the local villages and countryside so you can get a feel of the area. Despite the derelict state of this 1850 stone farmhouse, when Le Gargantua Cooking & Patisserie Holidays in France was first saw in 2004 by its actual owners, it was love at first sight! It was renovated it for 3 years, keeping all the original features and eventually opening in 2007. Bedrooms are situated on the first floor; four spacious and comfortable double bedrooms of an average size of 22 square meters (227 square foot), all with private en-suite facilities. The Pantagruel room has twin beds, while the Gargamelle room and the Grangousier room have a double bed, and the Melusine room has a four poster double bed. Furnishings and decoration are of traditional French country style. The house and bedrooms have bags of character, with exposed stonewalls and sloping ceilings, showing original oak beams. The perfect mix of rusticity and elegance. Upon arrival, settle in and make yourself at home. Enjoy a welcome drink with canaps, followed by a three-course dinner. After breakfast, you will go to a local patisserie to sample a few classics with a nice cup of coffee. This will give you a precise idea of the textures and presentations you will be aiming for when you produce them in the kitchen. Come back for lunch. At 13:00, you will meet in the kitchen to create your own pastries, which will be served for dessert that very same night. Be back in the kitchen until about 16:00. You will get some time to relax before 19:00, when you will meet for an aperitif followed by dinner. After breakfast, you will start baking. Stop for lunch and get back to the kitchen to finish the pastries. You will then again get some time to relax before the aperitif and dinner. Once again, your creations will be served for dessert that very same night. Today is the day of your departure. You can sleep in or wake up to catch an early train. French-born, Marlene, welcomes you in the heart of the Gascony countryside, for a fully hands-on cooking course in English. Marlene was born and raised in Calais, where she was a wine buyer. She has always been a food lover, whether it involved making it or eating it. Cooking is her passion and she loves to share it! This retreat will take place in Gascony, Anzex, France. Lot-et-Garonne is known as the garden of France, the landscape is quite unspoiled, nature and wildlife are preserved, and agriculture is thriving. The surrounding colors are the ones of wheat and sunflower fields, vineyards, and the deep green of the pine forest of the Landes de Gascogne. It enjoys a very pleasant climate, mostly dry and sunny. This is a land of eventful history, featuring Richard the lion heart, the musketeers and Henry IV. Many old stones still stand, silent witnesses of the region's historical heritage. Discover the Gallo-Roman relics, Romanesque churches, the impressive castles, and the old wash-houses. People of Lot et Garonne, and the south west in general, love their food, and love it traditional. The local cuisine is probably the most diverse in France, as it was influenced by the nearby cuisines of the Basque country, Perigord, Limousin, Languedoc, Pyrnes Mountains, and the Atlantic Coast. The closest to an accurate description of the local food is a hearty, peasant, tasty, beautiful for its simplicity, satisfying, interesting, and honest, without compromise. Lot et Garonne is known as the land of the geese, the fat ducks, and their foie gras. But it is also known as the land of game, cpes mushrooms, prunes, gariguette strawberries, sweet melons, white asparagus, and Marmande tomatoes. Your daily continental breakfast will consist in bread and croissants, fresh fruit, coffee, English tea, cereals, yogurts, home-made jams, and local honey. Lunches and three-course dinners will include wine. On the wine side, this is the region of Buzet, Ctes du Marmandais, Ctes de Duras, Ctes du Brulhois, Vin de Pays de Gascogne, and Vin de Pays de l'Agenais. The first vines of Buzet are about half a mile away from Le Gargantua Cooking & Patisserie Holidays in France cooking school. Local markets are exceptional for the abundance, variety and quality of the produce. They are so lively, and the traders care about their food very much. It is such a pleasure to walk round, smell, feel, and even taste the food! 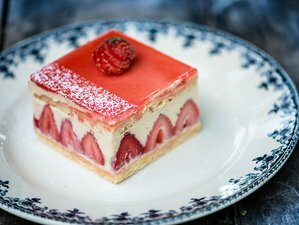 You will learn to make: chou pastry like clairs, religieuses, paris-brest, saint-honor or croquembouche, crme patissiere, short crust and sweet pastry, tarts, macarons, millefeuilles, bavarois, tarte tatin, croissants or puff pastry, and bread or brioche. Visit and enjoy tastings at a patisserie in Casteljaloux or a chocolaterie in Nerac. Of course, enjoy your creations serving them as dessert after dinners! Your time off will basically be from 16:00 to 19:00, after the cooking sessions, so you can relax in your room, or in the lounge, or even in the garden, with a good book for a little siesta. Of course, if you have a car, you can explore the area, there are nice places to see not far from the location. There are some bikes on site that you can use across the surrounding countryside. Grab a picnic and spend the day on the coast. Nature parks, water theme park, and near Arcachon, you can see and climb the highest sand dune in Europe: Grande Dune du Pyla, 107 meters high. There is a breathtaking view from the top, on the ocean, Landes forest, and even the Pyrenees Mountains, if the sky is clear enough. Of course everyone recognizes the name for being one of the best known wine appellation in the world. But Bordeaux is so much more! A breathtaking city, listed as world heritage. There are so many different faces to Bordeaux, that everyone can be charmed. Stunning architecture, great shopping, beautiful food, and wonderful museums. Although Bordeaux is the fifth largest city in France, it has a real village feel to it, and you will love wandering its old cobbled streets, or walking the beautiful promenade along the river. It was one of the four capitals of the region. It is bordered by pine forests and it is a pretty market town. Discover the charming Maison du Roy, used by the office of tourism, the impressive church Notre Dame and the original 15th century colombages, with timber, stone and bricks faades, as you wander down the narrow back alleys. Spend a day on the beach at the lake of Clarens, enjoy the colorful farmers market on Tuesdays and Saturdays, have a little fun at the casino, play a round of golf or get pampered at the thermal spas. Several pools, each with their own features - jets, relaxation, paddling, bubbles, and slides - in a roman style, surrounded by greenery and mineral beaches; you will find a snack bar on site. With 18 holes, par 72, 6468 yards long, putting green, and driving range. It is located next to the charming lake of Clarens, bordered by the pine forest of the Landes, and offers panoramic views. With 18 holes, par 72, 6384 yards long, putting green, and driving range. Also surrounded by the Landes forests, this course is very hilly. You might see deer or hares between the mature oak and willow trees. Magnificent views of nearby villages, vineyards and forests. Le Gargantua Cooking & Patisserie Holidays in France will be happy to provide you with maps of the hiking and biking trails, approved and maintained by the tourism authorities. It is a superb way to discover the region. There are many loop circuits around here, and bike rides are particularly nice along the canal latral, in the shade of the secular plane trees. There are two riding centers within 15 minutes away from the house. They organize rides in the country, in the forest, and outings with horse and carriage. Superb 13th century fortified village, selected as one of the prettiest villages in France. Take a stroll around the square under the arcades, and admire the condition of this exceptional historical legacy, as well as the breathtaking view from the top of the fortification. This beautiful town became the capital of the Navarre region in the 16th century, under the influence of the royal family of Albret. Nrac is surrounded by the vineyards of Buzet and Base River runs through it. Nicely preserved and maintained, a walk through the old town takes you back in time. You will also find in Nerac the chocolaterie La Cigale which inspired the author Joanne Harris for her best seller, Chocolat, lately transformed into the film starring Johnny Depp and Juliette Binoche. Take a stroll in the royal park of La Garenne, visit the remaining wing of Henry IV's castle, now a museum, the imaginary castle, the fortified four-tower mill in nearby Barbaste, or go for a cruise on the river. This stunning medieval city is listed by UNESCO world heritage; a must-see for its location, its historical monuments, its vineyards and numerous Grands Crus. There is plenty to do and see. You will be particularly busy if you like a bargain, as there are vide-greniers (boot fairs / flee markets) in the nearby towns and villages several times a week in the summer. Most towns and villages have their own celebration day with all sorts of games and events and the day ends with a big banquet, which is generally a themed one like snails, sardines, paella, and barbeque. You can vary your swimming locations in Casteljaloux: the lake of Clarens and its sandy beach, the thermal spa center with its various heated pools and finally the public open-air swimming pool, which is open from June to September and its four Olympic pools (25 meters, paddling and diving). The closest airports are Bordeaux-Mrignac Airport (BOD) and Bergerac Dordogne Prigord Airport (EGC). Rental cars are available from both these airports. There is a shuttle service between Bordeaux-Mrignac Airport (BOD) and Bordeaux train station, called Jet Bus. Departing from terminal B (arrivals level) at the airport, the Jet Bus shuttle connects Bordeaux-Mrignac Airport (BOD) to Bordeaux train station, via the city center every hour, 7 days a week. The ride from start to finish lasts around 45 minutes, depending on traffic. You can catch a Eurostar from London to Paris, or a fast train from most cities in Europe to Paris. You then need to get to Paris Montparnasse station, to catch a train to Bordeaux or Agen. Lot-et-Garonne local train station is Tonneins. There are TGV (fast trains) or slower regional trains coming to Tonneins from Bordeaux or Agen. There is approximately 1 train every hour. Le Gargantua Cooking & Patisserie Holidays in France offers cooking and patisserie courses in France with a professional cook for an authentic experience. This course is available all year round, with arrival on Sunday, Tuesday, or Thursday.